Gayatri Memorial Awards have been established by Ananda Mandir (Somerset, NJ) to recognize authors who have demonstrated excellence in writing through their published essays, poems, short stories or plays. The awards have been made possible through a significant contribution from Jerry GaMarsh, husband of late Gayatri GaMarsh. 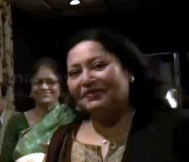 Gayatri was an accomplished author and artist – and a key member of the editorial team of Ananda Sangbad and Anandalipi, publications of Ananda Mandir. The Gayatri Award is administered through the Awards & Recognition Subcommittee of Ananda Mandir. Two cash awards will be given each year to recognize outstanding works published in North America-based literary magazines within the last five years. 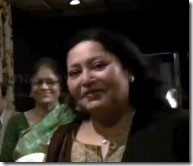 One award will be given to an author of Bengali works, and another will be given to an author in English. Each award will consist of $400 in cash and a certificate. An author may nominate himself/herself — or may be nominated by third parties (using the Nomination Form shown below). The nomination must be supported by photocopies of two (and only two) essays, poems, short stories or plays published in North America-based Bengali or English magazines. The two supporting publications can be of the same type or of different types (eg. one poem and one short story). Unpublished works of literature will not be accepted. Full publication references must be submitted for the articles submitted with each nomination. Articles published in magazines outside of North America will not be considered. Nominated authors must be 18 years or older. Each of their published articles (prose or poems), submitted with their nominations, should be relatively short (no more than 5 or 6 printed pages in length). Nominations should include short biographies of the authors. Judging, however, will be based primarily on the two supporting publications. Judges’ decisions will be final. Members of the Awards & Recognition Subcommittee and the judges cannot submit nominations for themselves nor can they be nominated by third parties. Deadline for nominations (with supporting documents) for the 2010 awards: March 31, 2011. Awards will be announced and presented in Fall, 2011. Please attach a short (one page maximum) biography of the author, highlighting the author’s literary interests and accomplishments. Please attach PHOTOCOPIES of TWO (AND ONLY TWO) of the author’s works of literature. For each work, PROVIDE FULL PUBLICATION DETAILS (name of magazine, publisher’s name/address, and date/year of publication).